There are big changes on the horizon for joint use professionals. With the race to attach and deploy services, the next few years will be a busy time for joint use professionals. The internet is continually becoming essential to daily life. People are demanding faster speeds and better performance from home broadband and mobile services. 5G and the Internet of Things (IoT) are shaping to up to turn the tide for consumers. Meeting the promise of future technology will require a higher level of network reliability and a more comprehensive infrastructure than what currently exists. Providers are in a hurry to make the necessary changes. 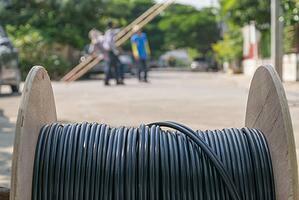 Two crucial parts of the technological shift are fiber optic internet and small cell wireless. We anticipate the pace of deployment for both will accelerate rapidly in the future. Fiber optic cable carries data in the form of light beamed through strands of glass. It offers clear advantages over copper cables in bandwidth, signal strength, safety and security, and is generally the preferred method of backhaul for small cell, especially in the United States. A small cell is a compact radio system (about the size of a backpack) that serves wireless users in a limited area. Small cell deployment has mushroomed this year, as wireless providers rush to eliminate coverage gaps and problem spots, particularly in urban and suburban areas. Over the next two years, the numbers are expected to triple. The rapidly increasing pace of small cell and fiber optic deployment is complicated for all joint use parties involved: asset owners, attaching companies, contractors, and other stakeholders. The FCC has recently changed the joint use game with the approval of the One Touch Make Ready policy. Managing this level of fiber and small cell deployment, especially with the new OTMR policy, requires involvement from more than just the joint use division. Accounting and engineering, for example, have crucial roles to play. Attempting to track everything on a spreadsheet, or by multiple methods, in different departments is confusing and outdated. The current level of fiber and small cell deployment may seem hectic compared to last year, and it’s just a small taste of what’s to come. Getting ahead and staying ahead of the explosive growth pattern means streamlining and automating joint use processes. In this fast-paced environment, Alden One®, our centralized joint use asset management platform unites companies across industries, allowing people to work better together. Multiple departments (within and between companies) use and access the same real-time information about the assets involved. Users should be able to see information relevant to their job, whether it be existing attachments or permits or requests in play. Our platform is flexible and accessible from desktops, laptops, smartphones, or tablets. Such mobility offers great perks to techs in the field. Such a system can minimize the surprises that add layers of complication to joint use issues. Many of the delays and problems common to heavy deployment can be avoided with the right management system in place. Alden One® is a joint use management platform that streamlines fiber and small cell deployment processes for asset owners, attaching companies, and other joint use partners. Alden also offers consultation services and managed services that make joint use challenges easier to navigate. If you’re interested in learning more about these products and services, contact an Alden specialist. How has fiber and small cell deployment affected your company in the past year or two? Start a conversation below.